Once Ramanujaacarya aproached his guru to recive secret mantra initiation. 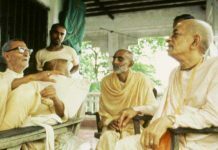 The guru, Gosthipurna began to consider the matter deeply, but still he was unwilling to give the mantra to any person. Time and again Ramanuja approached him, but repeatedly Gosthipurna refused his request. 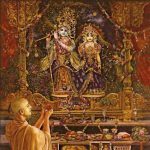 When his appeals had been denied on eighteen separate occasions, Ramanuja began to feel that there must be some great impurity in his heart and that it was for this reason that Gosthipurna would not bestow his mercy upon him. In this state of dejection, Ramanuja began to shed tears of despair. 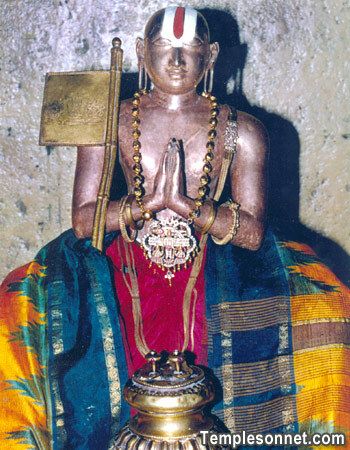 When some people informed Gosthipurna of Ramanuja’s condition, he was moved by pity for the young devotee. 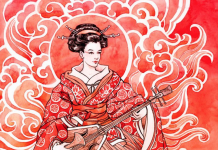 mantra of eight syllables. Ramanuja was filled with ecstasy to chant this wonderful vibration, and his face began to glow with spiritual effulgence. He considered himself the most blessed of all beings and bowed again and again at the feet of his guru. Having taken leave of Sri Gosthipurna, Ramanuja, in a joyful mood, began to return to Sri Rangam. But as he was walking, he began to think about the potency of the mantra that had been given to him. While thinking in this way, he became filled with feelings of compassion for the sufferings of all living beings in this material world. Attracted by his pure expression and unusual words, a large crowd of men, women, and children began to follow him. A rumor began to spread all over the town that a prophet had appeared who could fulfill all of one’s desires. Within a short time a huge crowd had assembled outside of the temple. On seeing this mass of humanity, Ramanujas heart swelled with joy. 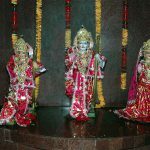 He embraced the two disciples who had accompanied him, Dasarathi and Kuresa, and then climbed up the tower of the temple. Immediately the crowd responded, everyone calling out the sacred words together, producing a sound like thunder. Twice more Ramanuja called out the mantra, and twice more the thunderous response resounded from the crowd. Every person became silent and looked at one another with feelings of deep ecstasy in their hearts. At that time it seemed that the earth had become Vaikuntha. The faces of the men, women and children were flushed with joy and it seemed that all miseries were gone from the earth. Those who had come running to the temple hoping to receive gold or jewels, immediately forgot their worldly desires, feeling as if they had been given a diamond in place of a piece of broken glass. As the joyful crowd melted away, men and women came and prostrated themselves beforeRamanuja, considering themselves most blessed to have received such a benediction from that great soul. Ramanuja then climbed down from the tower and began walking towards Gosthipurna’s residence to worship the feet of his guru. By this time Gosthipurna had come to hear in detail of everything that had taken place outside the temple and was extremely angry, feeling Ramanuja had betrayed his trust. 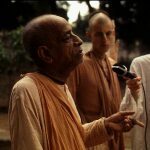 On hearing these words, which fully revealed the depth of the devotee’s compassion , Gosthipurna was completely stunned and filled with great wonder. All his fierce anger disappeared in an instant, like the passing of violent storm, and he embraced Ramanuja with profound affection. Everyone who was able to witness this transformation was filled with joy and astonishment. Gosthipurna then addressed Ramanuja with folded palms, ‘My child, I have never known anyone so magnanimous as yourself. From this day you are my guru, and I am your disciple. When Goshtipurna saw the earnest sincerity of his disciple, his heart was moved. After all, what greater principle can there be than the distribution of the Lord’s mercy. Although Ramanuja had disobeyed the letter of his instructions about the mantra, he had understood the real spirit of the mantra itself. 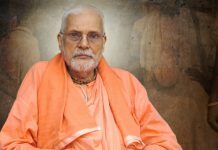 He would make a great preacher of the Sri sampradaya, and had shown that he had the capacity to instill devotion in the hearts of the people in general. How could he then be condemned? After this incident, Ramanujacarya’s reputation spread far and wide. He was regarded as an incarnation of Laksmana himself. He began training more and more disciples, and his camp grew. 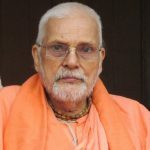 He engaged many scholars in debate and defeated them by propounded his sytematic view of Vedanta, known as Visistadvaita-vada, or qualified monism. One such scholar was Yajnamurti. Yajnamurti was a famous pandita who had defeated many scholars in argument and had written many commentaries on the scriptures. He challenged Ramanuja to a debate saying that if he lost, he would carry Ramanuja’s shoes and become his disicple. Ramanuja, for his part, declared that if he was defeated, he would give up books and arguments forever. The debate began and went on for 17 days. Ramanuja was discouraged. He prayed fervently to Lord Varada, his beloved Deity, for help. That night he had a dream in which the Deity assured him of victory, advising him to follow the line of reasoning given by Yamunacarya. From that day on, Ramanuja’s reputation increased. During this time, he toured India with his disciples, traveling as far north as Kashmir, where he consulted the commentary of Bodhayana on the Vedanta Sutras. 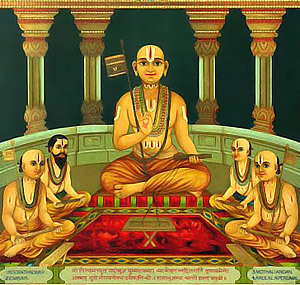 Ramanuja was also a great advocate of proper Deity worship and had a habit of reforming the system of worship wherever he went. 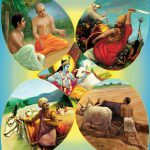 In this way, he standardized the system of worship throughout the Vaisnava temples of India, eliminating many of the practices of nonVaisnavas that had become traditional. 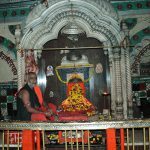 His system was not, however, greeted with much enthusisam in Jagannatha Puri, where worship is performed according to the system of raga-marga, or spontaneous devotion. It is said that after he attempted to reform the system of Deity worship there, Lord Jagannatha became disturbed. One night, as Ramanuja slept, he was transported by the power of Jagannatha to Kurmasthan. When he awoke, he thought he had committed a great offense to Visnu. 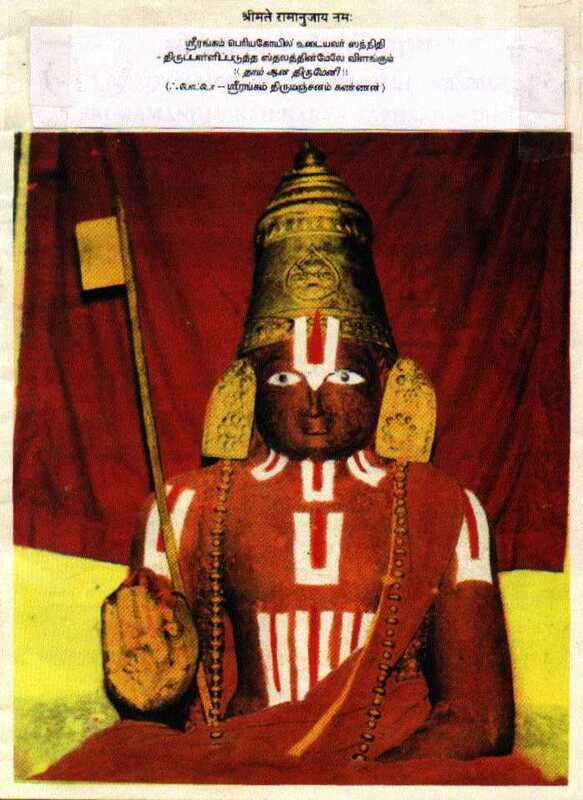 Mistaking the deity of Kurma for a Siva-lingam, he thought that Visnu had thrown him into a Siva temple. When at last he realized that it was a temple of Lord Kurma, Ramanuja set about reforming the deity worship there. 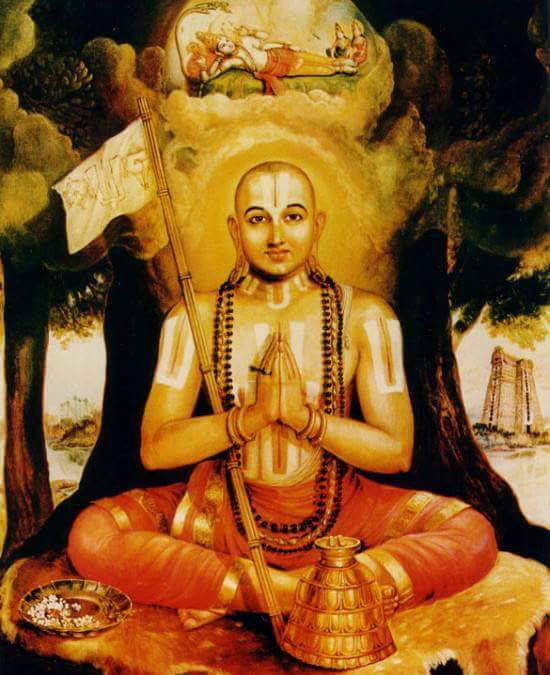 After this, Ramanuja wrote the Sri-Bhasya, his commentary on Vedanta, and his fame spread still further. All Glories to Sri Ramanujacharya!